A formula that consists of policosanol, phytosterol (plant sterols), inositol nicotinate (a form of niacin), resveratrol, and artichoke powder, Cholester-Reg II supports the heart and the circulatory system. It sustains normal cholesterol levels, contains antioxidants, and ensures that normal platelet aggregation levels are maintained. 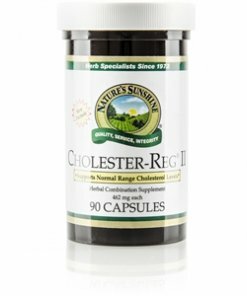 Each Nature’s Sunshine Cholester-Reg II capsule is 462 mg.